Fesoterodine fumarate 4mg, 8mg; ext-rel tabs. Overactive bladder (OAB) with urge urinary incontinence, urgency, and frequency. Swallow whole with liquid. 4mg once daily; may increase to max 8mg once daily. Severe renal impairment (CrCl<30mL/min) or concomitant potent CYP3A4 inhibitors: max 4mg/day. Urinary or gastric retention. Uncontrolled narrow angle glaucoma. Severe hepatic impairment: not recommended. Bladder outlet obstruction. Decreased GI motility (eg, severe constipation). Controlled narrow-angle glaucoma. Myasthenia gravis. Monitor for CNS effects esp. after initiation or dose increases; consider reducing dose or discontinue if occurs. Renal or hepatic impairment. Exposure to high environmental temperatures. Pregnancy. Nursing mothers. 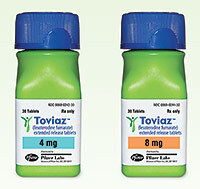 Potentiated by potent CYP3A4 inhibitors (eg, ketoconazole, itraconazole, clarithromycin); see Adult. Additive effects with other antimuscarinic or anticholinergic agents. Dry mouth, constipation, urinary retention/UTI, dyspepsia, dry eyes; angioedema (discontinue if occurs), CNS effects (eg, headache, dizziness, somnolence).